Notices – Sunnyside United Neighbors Inc. Celebrate the Spirit of the Spirit of the Mile High City! Register Now! The City will provide FREE barricades for your block party. Their is a limited amount of barricades available, best to register before July 7th. The G line of the RTD commuter rail line which will stop at the new 41st and Fox station was set to open at the end of October. However, due to problems with with the software controlling the crossing gates at intersections along the already-running A and the B lines, the Federal Railroad Administration (FRA) has said it won’t allow testing on the G Line until the problems are corrected on the A and the B Lines. We are looking forward to celebrating the opening of the rail line next year! Join your neighbors for an evening of free music in Chaffee Park Aug. 4th! Our 7th annual Jazz in the Park event is Thursday August 4, 2016 6 – 8:30pm in Chaffee Park (44th and Tejon). Jazz in the Park is part of Sunnyside’s Denver Days celebrations. The idea behind Denver Days is for neighbors to get to know one another, and as a result feel safer and more connected to the communities they call home. This year, SUNI is excited to announce that we’ve hired Denver’s own Delta Sonics to play. The Delta Sonics were the International Blues Challenge Semi-Finalist- Memphis 2012, and labeled “…the area’s best harmonica-led band.” by The Denver Post and “best blues band in Denver” by Westword. In addition to a great band, we have lined up 2 food trucks: Mile High Cajun and StreetZFood with food for purchase. Or, you can bring your own picnic! This is definitely a kid-friendly event. Chaffee Park has a great playground and plenty of space for kids to play. There are restrooms available and plenty of shade. We hope you will come out and join us for this fantastic event! 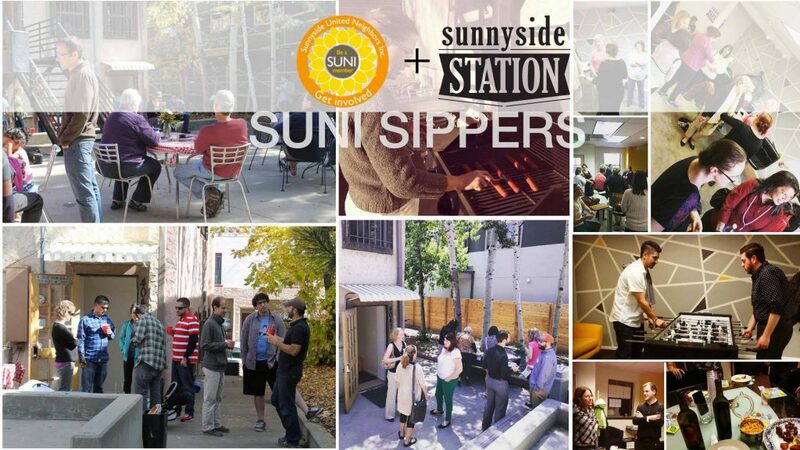 SUNI Sippers is part happy hour, part social, and part forum. This is an opportunity to socialize with your fellow neighbors and hear from SUNI about the latest hot topics while partaking in a local establishment’s offerings. Little Man Ice Cream will be scooping and making floats, and there will be plenty of outdoor games to entertain all. Don’t miss out on this fun neighborhood event! There is a lot happening in Sunnyside this spring! March 8th is our regularly scheduled SUNI Sipper, but with a twist: we will also be hosting a BINGO tournament! Big Country BBQ will be there, perfect for one of Diebolt’s perfectly-crafted beers! (Diebolt Brewing, 7pm) Be sure to invite your friends and family, even if they don’t live in Sunnyside – we’re hoping to make this one of our larger events! Save the Date for our Annual Pizza Party! April 27th at Smedley Elementary, 5pm. If you haven’t been, we serve up free pizza for paid SUNI members (you can update your membership from our home page). We also collect prizes from local businesses to give away! We will have lots of information about happenings in Sunnyside, as well as the election of new board members, so please plan to attend and meet your neighbors and representatives! We are also hoping to plan other springtime events, but we need your help! Could you help coordinate an alleyway cleanup for the Great Denver CleanUp May 21st? Want to help organize a neighborhood garage sale? We’ve already heard from neighbors wanting to start a running club (stay tuned) and look into getting a neighborhood Eco Pass. Let us know if there are any special projects you’d like to be a part of! No PCD Committee Meeting Tonight (2/11/2016)! Just a reminder, we are not going to have a PCD Committee Meeting this month as there are no issues that need immediate attention. I will send out an update soon just to keep everyone in the loop. Next meeting is March 11th at 7pm. Site is to be determined. We are looking for people to serve as voting members on this committee (not just interested neighbors!) The only requirements are that you attend 80% of the meetings throughout the year and also to pick something about Sunnyside that you feel needs some improvement and devote a bit of time to that interest. Things like beautification, traffic and transportation, zoning and development, etc. This involvement may involve doing some research on a topic and presenting at the meetings, organizing a group of neighbors for things like a clean-up project (if you are that ambitious! ), etc. Those sort of things. This committee is just getting back up and running, so there is plenty of room for ideas! Committee Members will get voting privileges at the meetings (or by email if a quorum is not met at a meeting). This is a great way to get involved with your neighborhood (and on occasion see how it fits in the big picture of Denver as a whole) and keep Sunnyside an amazing place to call home! Thank you all for your time. I’m looking forward to working with all of you and making this a productive committee! The Planning and Community Development (PCD) Committee is starting again January 14! For anyone interested in planning and development issues (zoning, design standards, liquor and marijuana licenses, new business Good Neighbor Agreements, etc. ), please plan to attend our monthly PCD Committee meetings. You will hear about current issues, have a chance to ask questions, and meet fellow concerned neighbors. The meetings will be held on the 2nd Thursday of the month at the Denver Police District 1 building in the Community Room (first floor – 46th Ave and Navajo). Dress up your pet(s) and bring them to Sunnyside’s annual pet costume contest at Chaffee Park. $5 suggested donation per pet. Prizes will be awarded for cutest, scariest, most creative and best in show! Prizes include $50 CASH, a $75 gift certificate for Ernie’s Bar & Pizza, a pet gift basket from Planet Pet and more! ALSO – online pet costume photo contest! Post your favorite pet costumes on FaceBook. We’ll pick winners based on number of likes and a panel of judges – winner receives gift bag from Planet Pet and runners-up receive drink coupons from The Highland Tavern Kitchen! Who: Sunnyside United Neighbors, Inc.
SUNI Sippers is back! This month the great Ernie’s Bar & Pizza invites you to come and hang out with your neighbors over some happy hour specials. Whether your new to the ‘hood or born and raised we’d love to see you there! Join us at 6pm to hear the latest news from SUNI followed by open announcements, and then mingling over appetizers until 8pm. Make sure to keep your calendar clear every second Tuesday of the month as we will be visiting other local establishments. Announcing: Jazz in the Park this Thursday! Free! SUNI is hosting the Denver Municipal Band for a concert in Chaffee Park. 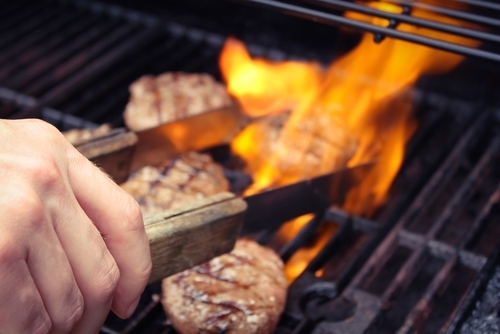 American Grind food truck will be there serving up burgers and ice cream, or you can bring your own picnic! What: Jazz in the Park this Thursday! Free! Join your neighbors and learn about all that’s happening in Sunnyside. We will have pizza and appetizers from Ernie’s Bar & Pizza along with salad, soda, and cookies! We’ll have LOTS of door prizes from local businesses… including an adult cruiser bike AND and kids cruiser bike from C3! Every entry includes a raffle ticket (additional tickets can be purchased) which you can enter for specifically for the prize(s) you want! The party/food is FREE for paid SUNI members! Please support your neighborhood by being a paid supporter: https://sunnysidedenver.org/ or you can sign up/renew at the party. [$5 for non-members and guests] Membership dues go towards keeping the neighborhood informed with postcards, newsletters and our website, as well as operating costs for year-round events and neighborhood outreach – thank you for your support! The Sunnyside Board (SUNI) is looking for new members with specific skills: Fundraising, event planning, accounting, writing/editing (newsletter, grants), graphic design (website, newsletter), website/social media management, and ENERGY! If you’re interested, please attend our meet & greet Monday, March 23rd, 6 p.m. at Deibolt Brewery and we’ll have free pizza! If you would like to stick around, from 7-8:00 p.m. we’ll be planning our annual SUNI Pizza party and Board elections taking place on April 23rd. Please join the Sunnyside United Neighbors, Inc (SUNI) and Ernie’s Bar & Pizza for the 6th Annual Sunnyside Sleigh Ride! Ernie’s will have 2-for-1 pizzas and happy hour drink specials all night! Bring your costumed pet to our annual Critter Costume Contest! $50 cash prize for Best in Show and gift card prizes for Cutest, Scariest and Most Creative costumes. $5 suggested donation to enter. Join us for hot chocolate, coffee and donuts! Kids in costume will receive candy! Meet at the SW corner of Chaffee Park (near 43rd and Tejon) at Noon to sign in. This will be a continuation of the Interstate 70 Expansion discussion that could affect all of Northwest Denver if CDOT ever chose to widen the I-70 West of I-25. At our August PCD meeting, we heard from opponents of widening I-70 and the unanswered questions they had for CDOT and the City. Tomorrow’s meeting is with CDOT, Mayor Hancock’s Northwest Denver Cornerstone Collaborative and representatives from Denver where we hope to hear answers to those unanswered questions. This should be a lively and informative meeting. We look forward to seeing you tomorrow at DPD1, 7PM – Community Room.